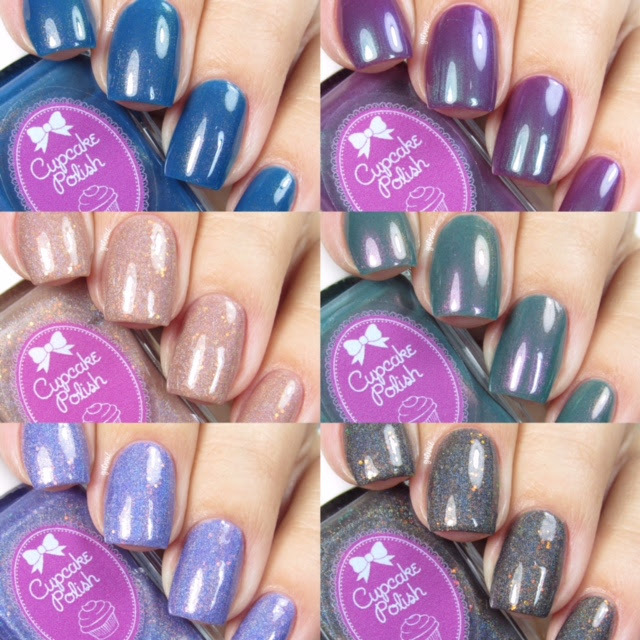 DALLAS, TX: Cupcake Polish announces its newest collection themed around the beautiful shimmering and glittering shores of the lake during fall! The Lakeside Collection by Cupcake Polish is a 6-piece collection of gorgeous mixed media polishes. Half of the polishes in this collection are a new finish for Cupcake Polish - gorgeous multichrome shimmer in a dusty creme base. The other half is a dusty twist on a favorite finish- linear holographic with shifty iridescent glitters. This muted fall color scheme will put a smile on anyone's face! Some of the polishes in this collection may require an extra coat than our usual formula in order to build up the delicate shifty finish -all polishes in the Lakeside collection are opaque in 2-3 coats. This collection launches on October 20th at 12pm CST.